The glamorous Hotel Carlton at 58 La Croisette in Cannes on the Cote d'Azur in Provence, France in Europe. 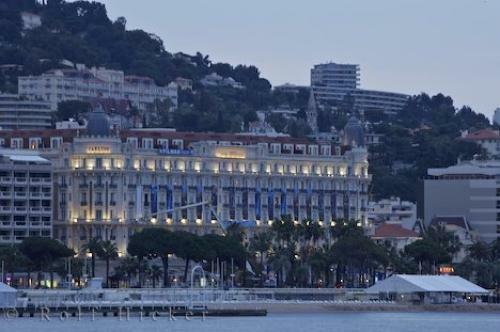 Photo of the Hotel Carlton in Cannes on the Cote d Azur, in Provence, France in Europe. ... has it they were a tribute to the breasts of 'La Belle Otero' (Caroline Otero) a famous Riviera courtesan around the time of the First World War, who was reputed to have counted Czar Nicholas 11 and King Edward Vll among her lovers.The Carlton Hotel, built 1911, along the waterfront of Cannes, The Riviera, Cote d'Azur, Provence, France, Europe. I photographed this photo with the digital SLR camera model Canon EOS-1Ds Mark II, aperture of f/14.0, exposure time of 1/2 sec. on ISO 100, as always I used a original Canon Lens, the focus lenght for this picture was 300mm.